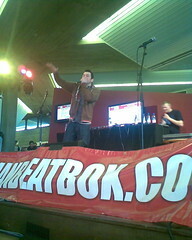 The 2008 Human Beatbox Convention has just ended, two or three days of more beatboxing than any sane person would ever wish to experience... some of my thoughts about it: it was wicked to meet up with other beatboxers, some I knew before, some I didn't, and do plennnnty of jamming. The main "events" were all onstage and yeah there are some beatboxers who do really good shows - Nino G springs to mind as the most showmanlike - but the kind of creativity I like is the type when half a dozen people in a circle and you're all throwing musical ideas around, keeping a beat but passing all the roles around, and the way you can play off each other without having planned it at all. That's why I think the pre-event party was kind of the wrong format, there were two mics and it was kind of freestyle and open but still it was another stage-vs-crowd setup in the end. The atmosphere outside the party was much better, groups of people jamming who'd only just met up, that kind of thing. I saw a million beatboxers do showcases and some of my favourites were Corroboree, Ball-Zee, and Skiller. Skiller's known for doing really really fast stuff and he does, but it's not like some mad fast D'n'B or gabba, it's more like a jazz drummer solo, and what is actually amazing about his stuff is how musical he is. I heard lots of people do really fast drumrolls this weekend but most of the others were basically showing off rather than really using them. Got onstage twice myself. First because Hobbit (hosting the thing) was looking so despondent that some of the open-mic people hadn't showed up - damn I really wish I'd used the time more wisely, I basically just did my favourite beat and jumped right off stage again - and second in a mass onstage jam at the end of the last day. About thirty of us onstage, taking turns on five mics, kind of taking the group jam thing onto the stage. Anyway got to go to bed. Met up with good people, got an american addicted to chips and curry sauce, got ideas maybe to do something for next year's convention... looking forward to seeing online videos of all the jams!